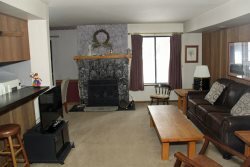 Standard, One Bedroom with Loft and two Bath condominium walking distance to the Canyon Lodge Ski Lift area. Sleeps up to 6. 1 queen bed in the bedroom, 1 queen bed and 1 set of bunkbeds in the loft, and a queen foldout couch in livingroom. 3 TVs (1 new large flat screen HD TV in the Living Room), 3VCRs, 2 DVDs, stereo/cassette/cd player. Wifi Internet Access in the unit. Unit phone number 760-924-2781. UNLIMITED LONG DISTANCE PROVIDED IN UNIT. (1050 sq. ft.) First floor is the Bedroom, Kitchen, Dining Room, Living Room and 1 full Bathroom. The second floor is the Loft and the 2nd full Bathroom. The Loft is enclosed except for the stairwell area. This is an upstairs unit...you enter the unit from an enclosed hallway in the Chamonix B Building. There are two outside parking spaces available. Chamonix Recreation room with large screen TV, reading area, ping pong, foosball, and business center with fax, copier, computers w/ internet and laptop hook-up. Sauna, hydro spas, seasonal/summer swimming pool & BBQ area. Coin-operated laundry facilities located in the common area near the office. COMPLIMENTARY INTERNET and CABLE TV are provided, however NO REFUNDS will be given for connectivity problems or Internet failure. TOT LICENSE 1968-CX28. Great location and great communication with Central Reservations of Mammoth. Thanks! Awesome location. 5 minutes walk to Canyon Lodge and adjacent to the town shuttle stop. Thank you so much for the great hospitality and the place was great and very convenient. I enjoyed the stay a lot with my friends, the complex had a great location and great jacuzzi area. Everything was fantastic.